Semi-double to double red blend—herbaceous x tree hybrid. Seed parent. Bartzella. open pollinated. First bloomed 1990. Divided 1993—24-26″ height. Red and yellow blend, with yellow fading to cream on outer facing petals. Inner petals remain red and give the bloom that inner glow effect. Excellent plant habit. One of my six favorite herbaceous – tree hybrids. No fertility noted. Award of Landscape Merit (ALM) description: ‘Hillary’ (Anderson, R.F., 1999) Intersectional, Mid- to early late-season, 24″ — Petals are heavily washed old rose/deep pink with the innermost petals having prominent deep red flares at their base; semi-double. As mature blooms fade to cream, petal edges become delicately picoteed while the flares retain their color intensity. Plants are covered all over, from top to bottom, with buds that pop open intermittently over a 10­–14 day period. At peak bloom, a plant can hold a large contingent of attractive blooms at varying stages of development. When sited in a garden with a more subdued spectrum, ‘Hillary’ with its delicate coloring and a low brightness level is gorgeous. Foliage is dissected and semi-glossy, remaining green well into late fall. Bush is compact and wider than tall at maturity. Dimension of a six year plant is approximately 24″ x 32″. Propagate by division. 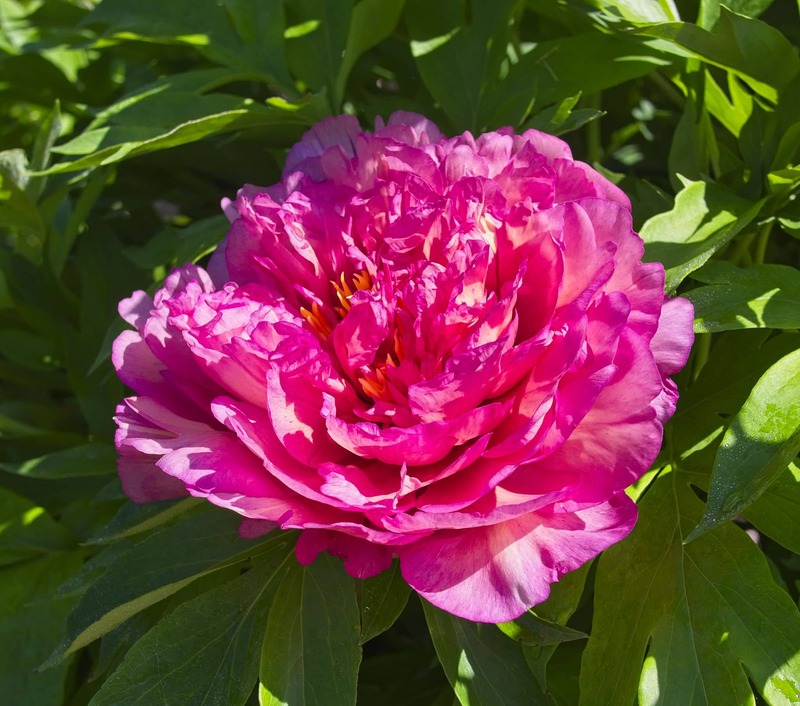 "Paeonia ‘Hillary’, 2018 photo, (3-SD-R) Itoh intersectional Hybrid Peony, (Anderson, R.F., 1999), USDA Hardiness Zone 4, Medium height, semi-double, creamy red petals, fades to cream with darker center, early midseason bloomer, Michigan Bloom Month 5-6, In Garden Bed S3 for 3.6 YEARS (Broo). Planted in 2014.